JACKSON TWP — Whether taken from the corner, wing or the top of the key, it didn't matter. 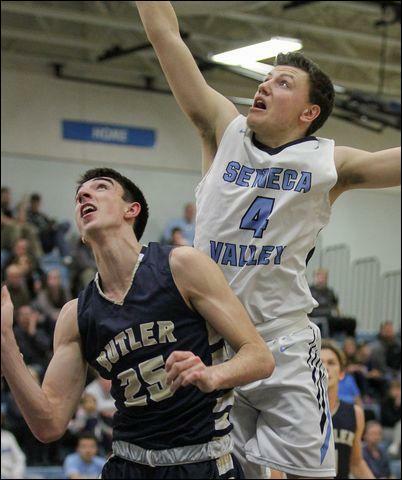 Butler's outside shooting proved deadly to host Seneca Valley. The Golden Tornado drained 13 treys to sink the Raiders, 72-67, in a Section 1 contest at William Paul Gymnasium. Sophomore Luke Patten and freshman Mattix Clement both came off the bench to knock down five 3-pointers, helping Butler shoot 50 percent (13-of-26) from beyond the arc. “Our team is built to have a lot of guys come in and make plays,” said Tornado coach Matt Clement. “For some of those guys, the outside shot is their specialty.” Seneca Valley never held a lead in the second half, though led by David Ritchie and Dalton Peffer, SV cut its deficit to 58-55 with just over five minutes remaining in the game. Both offenses hit a lull, but due in large part to treys from Mattix Clement and Patten, Butler pushed its edge to 68-57 with 2:13 left. The Raiders pulled closer in the final minute with reserves on the court for both teams. The Tornado (13-1, 5-1) showed its willingness to take outside shots — and the ability to make them — in the first quarter when the team drained four of them. But SV's Jake Bunofsky and Ritchie both hit a trey of their own and the Raiders were clinging to a 28-27 lead with 1:15 left in the first half. Butler used the remaining time to drop an 11-0 run on the Raiders. Not surprisingly, 3-pointers spurred the effort, with Colby Anderson, Clement and Ethan Morton each making one. The result was a 38-28 lead for Butler at halftime. “Five of those (3-pointers) were uncontested,” Giannotta said. Morton led all scorers with 23 points and made all 10 of his free throws. Patten scored 17 and Clement 15. The Raiders (8-5, 2-4), who lost their third straight section game, were without senior swingman Chris Hart for the second straight game. His return from an ankle injury is still unclear. Peffer stepped up and scored a career-high 17 points and Ritchie tallied 16. Butler's only loss to date is a section defeat to Pine-Richland last month. “We only returned two guys with significant varsity time from last year — Luke Michalek and Ethan Morton,” Coach Clement said. “I figured it would be (mid-January) when we could potentially see the team coming together. Luke Michalek 2 1-2 5, John Michalek 1 0-0 3, Mattix Clement 5 0-0 15, Tarik Taoufik 1 2-4 4, Luke Patten 5 2-2 17, Ethan Morton 6 10-10 23, Isaiah Scribner 1 0-0 2, Colby Anderson 1 0-0 3, Doug Kostelansky 0 0-0 0, Ben Kranbacher 0 0-0 0, Mason Montag 0 0-0 0, Dom Schmidt 0 0-0 0, Nick Stazer 0 0-0 0. Totals: 22 15-18 72. Jake Bunofsky 3 1-1 9, Josh Rupert 2 0-0 4, Gabe Lawson 3 0-0 6, Marcus Might 3 1-1 7, David Ritchie 6 3-3 16, Zac Zajacs 2 0-0 4, Dalton Peffer 5 6-8 17, Mason Bush 1 2-2 4, Dom McGowan 0 0-0 0, Brendan Koken 0 0-0 0, Trey Berringer 0 0-0 0. Totals: 25 13-15 67. 3-point goals: Butler 13 (Clement 5, Patten 5, Morton, Anderson, J. Michalek); Seneca Valley 4 (Bunofsky 2, Ritchie, Peffer).